The clasp is easy too! I'll show you how to make it on this page. There are two ways I like to do daisies. I even switch back and forth between the two when I start to get bored doing it one way. ;) I'll show both here, and you can do it however feels best for you. 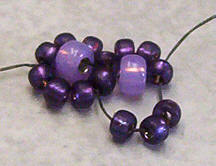 The first method is to pick up 6 beads, and go up through the bottom side bead. 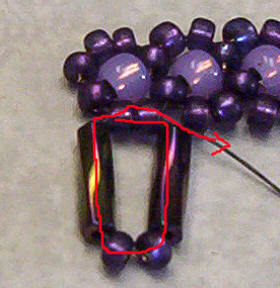 Then Pick up your center bead, and go up through the top side bead as shown. Repeat to end of bracelet. 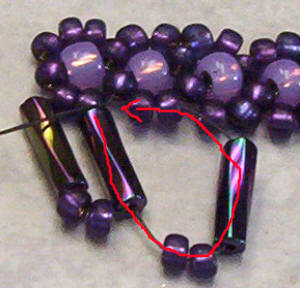 The second method is to pick up three 11s and your center bead, go down though the bottom side bead, (pic 1) then pick up three more 11s, and go up through the bead next to the center bead. Repeat these two steps to the end. This bracelet is all about options! The next option you have is how to add the next two rows. One method would be to add the bugle row just as you would another daisy row. 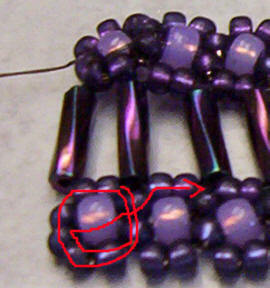 (Without the center bead) Then add the third (regular daisy) row. Or, you can make another daisy chain the same length as the first one, and then attach them together with the bugles using a double-needle cross weaving technique. Since bugles have sharp edges, I prefer the first method because you're sewing through the bugles multiple times, so it lessens the chance of the thread being cut. But the cross weaving method is much faster. ;) I'll show both, and let you decide. 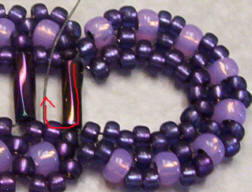 In the first method, after you make your last daisy, needle around until your thread is coming out of the top beads. Pick up a bugle, 2 seeds, a bugle, then go back through the two seeds. Now you have to sew back through the bugle you just added to get in position to add the next one. Go down through bugle 2, follow through the two seeds, and back up through bugle 3. When you get to the end of the bracelet, you're ready to add your final daisy row. Needle around until you're coming out of the bottom two seeds. Pick up 6 seeds, and go back through the 2 bottom seeds. 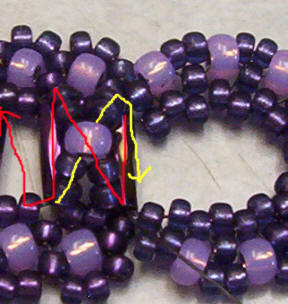 Go around the circle again until you're coming out of the bottom side bead. 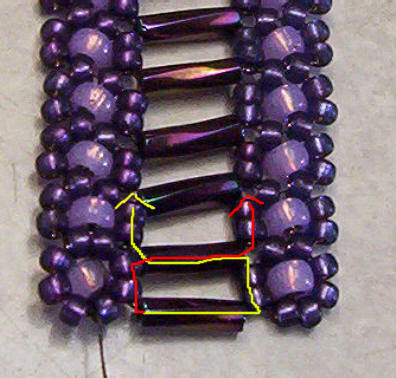 Add your center bead, go up through the top side bead as before, then go through the next two bottom seeds in the direction shown. Now pick up 4 seeds, go up through the bottom side bead, add your center bead, go up through the top side bead, and then through the 2 bottom seeds of the next bugle set. Repeat this step until the end. With this method, you make 2 separate daisy chains, and lay them side by side with the thread tails at opposite ends. Now thread one needle at each end of a length of thread. Pick up a bugle, and let it drop to the middle of the thread. The red and yellow lines represent each needle. Go through the top two seeds of the right daisy with one needle, and the bottom two seeds of the left daisy with the other needle. 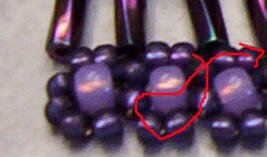 Pick up another bugle on one of your needles, then cross through it with the other needle as shown. Go through the next sets of 2 seeds with each needle, and repeat adding the bugles in this manner to the end. Now you'll have to weave in the ends of each thread. Do this in the same way as you normally weave in the ends. So you end up with just your original tails coming out of your daisy chains. 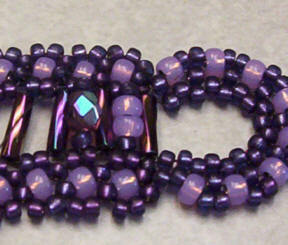 After I get these three rows done, I like to add one side of the clasp before adding my embellishments. 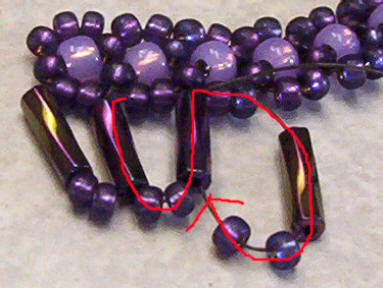 If you want to make the clasp shown, go to the clasp page now. If not, just add one side of the clasp of your choice. Now for the fun part! (Just in case you weren't having fun yet. lol) Adding the embellishments!! Now that you've finished the base of your bracelet, you have these wonderful 'windows' that you can fill in with virtually any bead(s) you like! Time to get creative, and make this bracelet your own. 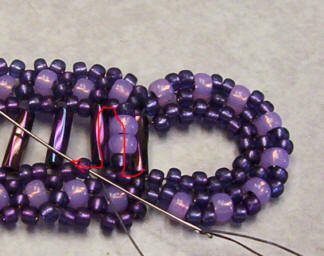 Try different beads, and try stitching them upright, or making a cross, like in a hugs & kisses bracelet. (Both methods shown below.) 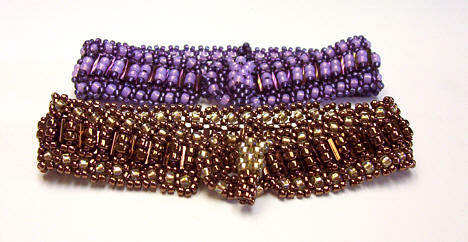 It's all up to you, and how you want your finished bracelet to look. If you want to make it the way I did in the bracelets shown at the start, all you do is needle through the bugle, and through one bead in the two bead set on the top of a daisy row. Pick up one 11, two 8s, and one 11. Go up through one seed in the bottom of the top daisy, then down through the next bugle, and through the first seed in the top of the bottom daisy, and repeat to the end. Simple! 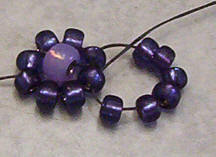 In this pic, I tried using a 4mm round crystal instead of the two size 8.0 beads. Mmmmm......sparkly! Making crosses is easy too! All you do is go down through the bugle, pick up two 11s, one 8, and two 11s. Go down through the next bugle to the end. Then come back and finish the second half of the cross by picking up two 11s, go through the 8, and pick up two more 11s, then down through the next bugle. The red line is the first pass, and the yellow line is the second pass coming back. Click here to see more pics and examples! If you'd like to share a picture of the bracelet you make using this tutorial, email it to me, along with information on what beads you used, and any other information, tips, etc. that you'd like to share. If you'd like your email and/or website address linked with your picture, please send that information with the picture. :) I'll post the pictures I get on the Examples page. Click Here if you'd like to support this site to keep these tutorials online. Thanks! NOTE: This tutorial prints best from Internet Explorer.It may not print all the pages from other browsers.